Jeep’s 2019 Wrangler is the 2019 MotorTrend SUV of the year! 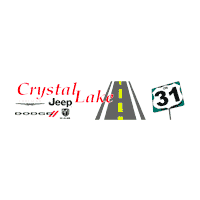 It sports a classic Jeep SUV design with a removable top and doors for an incredible open-air experience whenever you would like. The 2019 Jeep Wrangler also features updated technology, safety and convenience, and many more exclusive interior and exterior features. Continue reading to learn more! MotorTrend, an American auto magazine that provides car news and expert reviews, confirms the wide capabilities of the redesigned and re-engineered 2019 Jeep Wrangler in its review of this outstanding SUV. MotorTrend highlights the 2019 Wrangler’s on-road and off-road performance, its advanced design, excellence in engineering, efficiency, safety, and value. 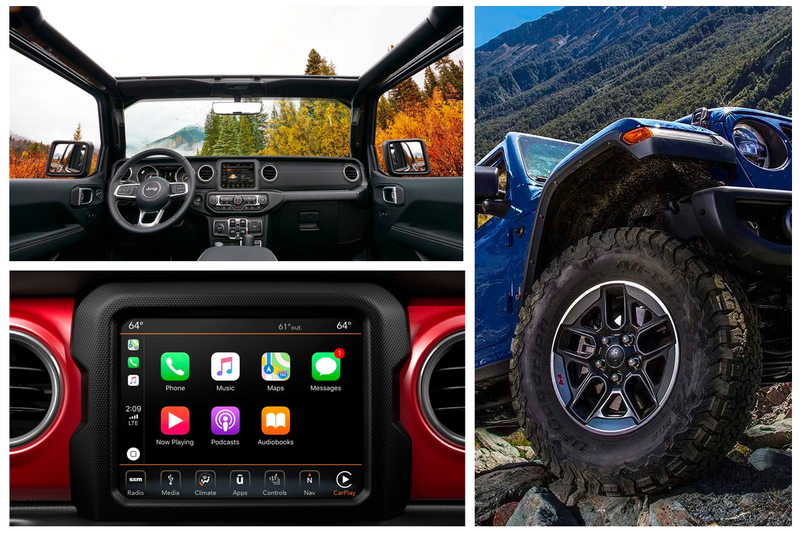 All of these advanced features and more are what make the 2019 Jeep Wrangler the MotorTrend SUV of the Year. The 2019 Jeep Wrangler managed to keep the classic Jeep design while still incorporating modern features for an enhanced SUV with an unmistakable look. For example, not only is the Wrangler’s roof removable, it has a power panoramic sliding roof system that provides that open-air feeling at the touch of a button. Add the available removable rear-quarter glass panels for added open-air sensations. The 2019 Jeep Wrangler also has available LED headlights and premium LED taillamps. These modern features and many others give the 2019 Jeep Wrangler an updated look without compromising the classic, rugged design that Jeep SUVs are known for. The interior of the 2019 Jeep Wrangler offers comfort and convenience in the form of advanced technologies and exceptional cargo space. In the cab of MotorTrend’s 2019 SUV of the Year you’ll find high-quality materials, like available leather-trimmed seats, and high-tech features like the available Uconnect® 4C NAV. This system keeps you connected through an 8.4-inch touchscreen. You will also get an available 7-inch Driver Information Digital Cluster Display, an available Alpine® Premium Audio System, available Trail Rail™ System for customizable storage options, a standard wash-out interior and a lot more. As far as added cargo space, the 2019 Jeep Wrangler features mesh storage nets, a lockable center console, and a removable cargo floor. With three available All-Wheel Drive systems, the 2019 Jeep Wrangler has outstanding capability for off-roading but is also well-equipped for city driving. The Wrangler earned the TrailRated® badge by passing a set of tests through tough terrains, which shows its ability to withstand harsh conditions. This rugged SUV also has available 33-inch off-road tires, an available winch-ready steel front bumper, and plenty of other options to improve off-road capabilities. In sum, the 2019 Jeep Wrangler is equipped with advanced, modern safety features so you can be confident whether you’re driving the trails or the highways. There are more than 75 standard and available safety and security features in the Jeep Wrangler including available Blind Spot Monitoring and available Rear Cross Path Detection so you’ll know when other vehicles are in hard-to-see spots. Pair these available features with the standard ParkView® Rear Back Up Camera and you’ll lower your risk of vehicle collisions. 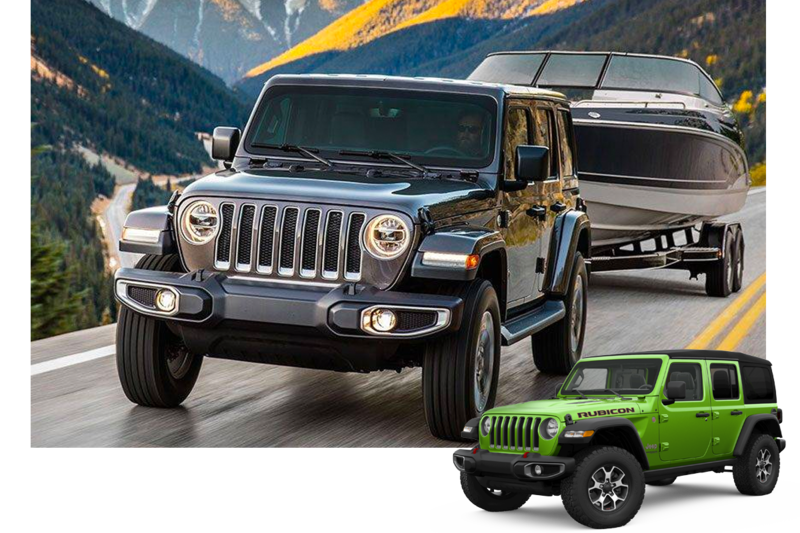 For towing, the 2019 Jeep Wrangler has Trailer Sway Control. Finally, true to the Jeep Wrangler tradition of preventative engineering for improved safety, the 2019 Jeep Wrangler has an advanced front and side airbag system as well as high-strength steel beams.